Navigating through QuickSpot's menus is easy and, in fact, very innovative (see below). The multiplayer menu is one of the two primary options on the main menu. The open credits sequence is forced, but only consists of one screen. The download is split into two portions. Initially, the game downloads (20-25 seconds) and then the images download (another 20-25 seconds). This actually improves the efficiency of the game: if you play again (with different images), it doesn't need to download the game portion again - just new images. The menus on QuickSpot may be the most efficient and accurately navigatable menus I've ever seen. Not so much in the organization of the options - there's nothing wrong there, it's excellent, but nothing special. The big benifit is in the actual method of navigation. In the game, you're motions pretty much consist of just drawing circles. So what did they do for the menus? You have to circle your option. Why is this special? There's no accidentally going into the wrong area. No errant taps will send you to the wrong place. In fact, simple taps won't do anything (in the multiplayer menus, anyway). It's almost impossible to "accidentally draw a complete circle" around the wrong area. The game is very good at knowing EXACTLY what you meant. Obviously, there's plenty of buffer space between options (there pretty much has to be). Some of the options are a little small (particularly those along the bottom edge of the touch screen - like "Back"), but they're manageable. Play control is pretty solid in QuickSpot, but not flawless. To play, you draw circles. The game's programming looks for closed circles, so if you change your mind before completing the circle, simply stop drawing and pick up the stylus. You're not going to accidentally circle the wrong thing, so you can proceed boldly. The downside of this is that, if you wanted to draw a complete circle and just "missed" completing the circle, it won't count; this is annoying because you are on a time limit. The graphical style can change drastically from image set to image set and very little is animated (just the Distractions). Some of the changes between the images in a set are so well tuned to the art style that it looks like both were the original concept (some, but not all). A drawing sound effect is included and the music is very upbeat and happy, but NOT sugary. There are no options to choose from - just the one activity. On the surface, you might not think of a game where all you do is draw circles as a fun activity. In truth, it is. While drawing circles may be the only thing you physically do, there's a lot of quick thinking and quick analyzing going on. Add to that the direct head-to-head competition and the distraction system and you have a game where where players, especially those with a competitive streak, can enjoy themselves in a competition that goes beyond just basic video game skills and into the realm of thinking. The difficulty is (mostly) set by the skill level of your opponent and the more competitive you are, the more you'll enjoy the game (as long as you're not a "rude-competitive" and scare friends away with it). 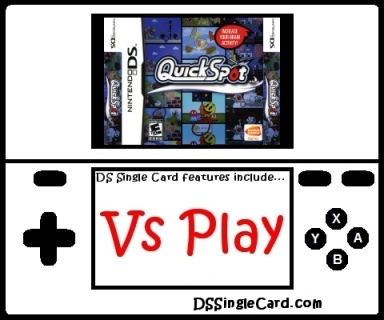 QuickSpot can be played by die-hard gamers and casual gamers alike and you don't have to have any experience to pick it up and play (which is good, since most plasyers who download the game - guests - likely don't own it). If you like the brain-styled games, think of QuickSpot as an activity from them that is stretched out and expanded upon in the best way possible. There are a lot of different images to work with and most have multiple changes that the game can randomly select, so even if you've seen the image, the change may have been a different one the last time. Depending on how good you (and the other players) are, the game will go quick. I definitely plan to keep playing QuickSpot. Got a few minutes? See what you can see. Add in a Single-Card Download "Time Bomb" mode. Allow hosts the ability to select art styles - Anime, Classic Characters, etc. Offer the ability to have the lower screen images need to be cleared (with the stylus or by blowing into the microphone - a la the single-player game). Click here to return to the DSSingleCard.com QuickSpot profile.